On the major European and Russian fronts throughout World War II, the challenge of crossing rivers under fire was absolutely central to any advance. The Panzers that crossed the Meuse at Sedan in May 1940 cut the French Army in two. The Wehrmacht's ability to cross the great rivers of the western USSR was vital to the lightning advances of Operation Barbarossa in 1941, and in 1943-45 the Red Army had to drive the Germans back from a succession of river lines during their advance to the Reich, culminating in the Vistula and Oder lines. With World War II armies dependent on heavy mechanized equipment, the function which rivers played became essential for soldiers in all sides of the war. 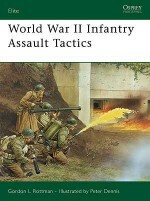 World War II River Assault Tactics details the methods, means and analysis of specific successes and failures. Featuring a wealth of wartime photos, particularly from German sources, and full-colour plates illustrating tactical scenarios, the subject is brought to life. Gordon L. Rottman entered the US Army in 1967, volunteered for Special Forces and completed training as a weapons specialist. He served in the 5th Special Forces Group in Vietnam in 1969-70 and subsequently in airborne infantry, long-range patrol and intelligence assignments until retiring after 26 years. He was a Special Operations Forces scenario writer at the Joint Readiness Training Center for 12 years and is now a freelance writer, living in Texas.Peter Dennis was born in 1950. Inspired by contemporary magazines such as Look and Learn he studied illustration at Liverpool Art College. Peter has since contributed to hundreds of books, predominantly on historical subjects, including many Osprey titles. A keen wargamer and modelmaker, he is based in Nottinghamshire, UK.